What a weekend down in Rotorua at the Tarawera 100… despite the course change and the prospect of running an out and two-thirds back, this race produced some stunning results and unearthed some of the future rock stars of trail and ultra running. It’s easy to start with Sage Canaday and his amazing performance against Western States champ, Tim Olsen, but for me and many others, we bow down to the rising star of female ultra running that is Ruby Muir. The talk around the town was that Ruby was a serious talent to watch, but let’s just put her performance this weekend into perspective. She completed the 100km course in an amazing time of 10:30, finishing 7th overall and taking out some of the male elite runners on the process. But delving even further, she finished just 1.5 hours behind Western States 100 champ and record holder Tim Olsen. When you do the sums, is it plausible to think that if trained and conditioned correctly, could Ruby be a 17/18hr Western States runner? If so, we’re talking serious title contender and in the company of the likes of Ellie Greenwood and Lizzy Hawker. It’s a big call to make, and of course, there are a lot of ‘if’s and buts’ to account for, but I seriously believe that she has the potential to mix it on the world stage with the likes of these names. But before we get too excited, we have to remember that this weekend was her first 100km and she’s just 21. But it’s a wise head on those young shoulders. She put over an hour into Beth Cardelli for crying out loud and Beth is the current TNF100 Australia champ and record holder! Admittedly Beth went into this race on little prep, and had she not been coming back from injury we would have probably seen a close race, but still, the result from Ruby was astounding. I was lucky enough to catch some time with Ruby on the Thursday ahead of the race after the fun run in the Redwoods Forest, just outside Rotorura and it’s clear from speaking to her that she’s extremely calm and probably doesn’t realise just how talented she is. Her foray into running came about from hard personal circumstances, but it’s through adversity that many believe you become stronger. She loves the tough technical stuff and it would be amazing to see her mix it with the likes of Lizzy Hawker at UTMB sometime in the next few years. She harbours desires to head over to Europe and take part in some of the Sky Running races, and to think she does all her running in the tiniest little lightweight Vibram Five Fingers you can buy. Many of us were inspired seeing Ruby sprint across the line, with boyfriend pacer in tow, and the sounds of his speakers blasting out the tunes as she smashed across the line. The guys over in NZ have known about this pocket rocket for a while now, but the rest of us are only just realising what a talent we have down here in the Southern Hemisphere – we’ll be following her progress with much keen interest. Now what about Sage Canaday and Tim Olsen? At 75kms, Sage had it in the bag with 27 minutes between himself and Tim. But Tim knows how to hurt and has the legs to match anyone in an ultra distance event – and he almost pulled it off. I was running in the 60km race, and on my way back to the finish line, having completed the out and back section I was constantly looking over my shoulder and listening out for the footsteps of the 100km runners, hunting us down like wounded prey. Sure enough with around 3kms to go to my finish, along comes Sage, gliding across the rocks and tree roots that I was struggling to stay upright on. His running style (like many others at the elite end), is so fluid and ‘easy’. What I also noticed was how long his stride was too, but how effortlessly he seemed to be moving along. Sage admitted that from 50kms onwards, he was hurting, and it’s no surprise when you hear that at 30kms, with the pack all lined up he pounced and left them for dead. It was at this stage that he simply blew the field apart, which is how you would expect a 2:16 marathon runner to behave. And while he paid later in the race and it almost didn’t come off, you have to admire him for putting his balls on the line and coming out the other side with a wonderful win against the current WS100 champ. Tim Olsen is a complete champ too. Quiet, reserved and very understated, you’d hardly know he was one of the best 100 mile runners in the world right now. Both him and Sage are a massive credit to the US ultra and trail running scene and they came here to race and put their balls and reputations on the line, giving it everything they had. It’s very early in the season for the US runners and it would have been easy for them to take a shorter option, or just not race hard at all. It’s here that credit has to go to the trio of Vajin Armstrong, Brendan Davies and Mick Donges for giving them a race. All three of these fellas put everything they had into this race so that it would remain a contest and not some easy ride for Team USA. Both Tim and Sage did a lot in showing us guys down here how welcoming they are and how they embraced the whole experience. Politely stopping for photos, giving interviews and signing autographs at the end of the race. Both made time for anyone who wanted it, and the US trail running folk should be extremely proud of these two guys for making the effort to fly 14 hours and show us how the elites do it. Vajin, Brendan and Mick all gave very valiant efforts and did remarkably well to all finish under 10 hours on what is a much tougher course than the original. I know that having spoken to them all, they all wanted to make a fist of this and test themselves against the very best – a big hand must go to them. Although we’re not in the same league as the Sage’s and Tim’s of this world, Aussie and NZ ultra running has come a long way in the last two to three years or so. 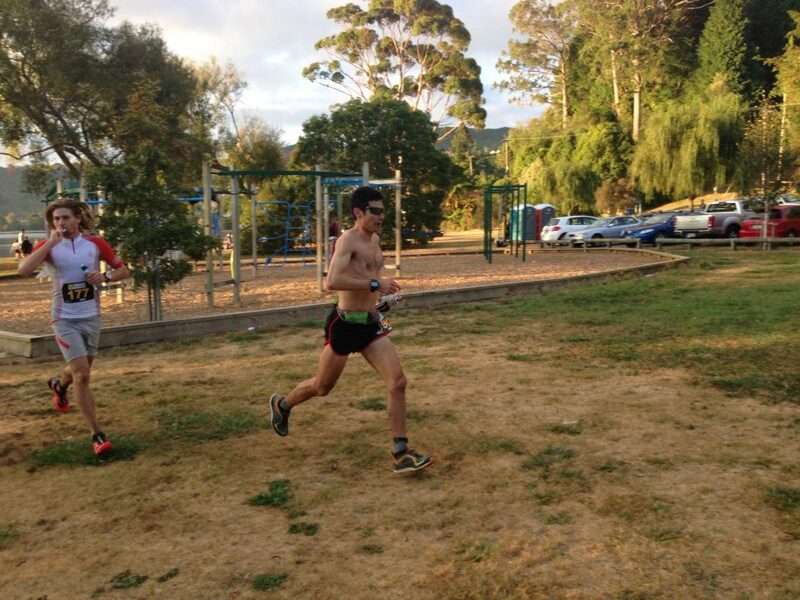 It’s through having races like Tarawera and TNF100, along with the efforts made by some of the World’s elite to race them that has seen our standards rise. Our boys and girls now want to do well against these guys and the efforts are showing. And finally a word for race director, Paul Charteris, who has taken what was a small race dotted somewhere in the North Island of New Zealand, and in just five years has assembled the best field in a Southern Hemisphere race for years. Races are not just about race day. It’s about building an experience that people can be a part of over the course of 2-3 days. From the fun run in the forest, which saw the likes of Tim and Ruby rub shoulders with everyday trail folk, through to the elites Q&A in front of a 300-strong packed house and then an amazing race and kicking back with a few beers with the finishers. I went along to this race as a runner and a reporter for Ultra168. Naturally the top end of town will say how great this race is, but the real test comes from the rest of us as I like to coin a phrase – the everyday hacks. What was great about the out and back section in the 60km was the amount of people I got to say hello to and also chat with, and each and everyone had either a smile or a great thing to say about this race. This is how trail running should be – Bring on The North Face and the next installment. On the 23rd February I had the privilege of sitting next to Ruby on the bus to the start of the Shotover Moonlight Mountain Marathon. She was the first woman home over a very challenging course and then to win again 3 weeks later at Tarawera proves what a wonderful talent she has. 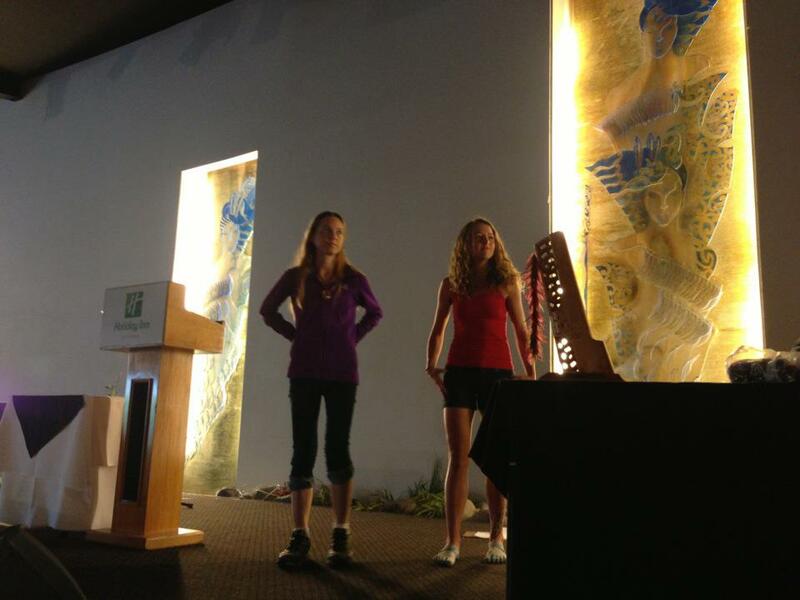 Ruby Muir also carved up the Kaweka Mountain Marathon (46 km 3500 m) not that long ago, first woman, third overall. 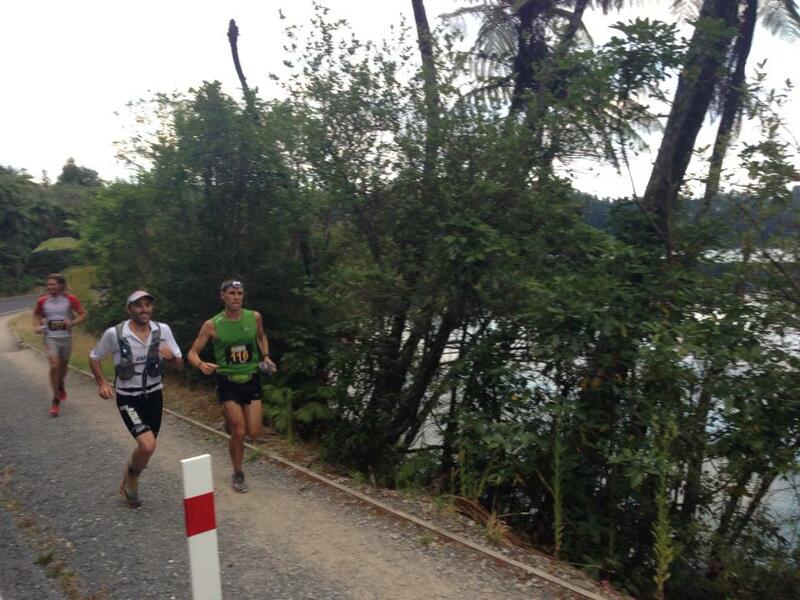 One of NZ’s most challenging events in that distance range. She also beat the great Helen Diamantides CR on that course. Thanks Dan, great write up. You, Marcus and the rest of U168 also need to take credit too for the growth of the sport in Australia and NZ. Brilliant job covering this event guys! It was one hell of a tough course. The closest thing I can compare it to is the Basin out and back section of the GNW mixed with the twistiness and terrain of the GOW. Agree about Ruby, serious talent there. Great wrap up and it was fantastic to see those elite runners chewing up the course coming back towards us weekend warriors. i may be wrong but it looks like the tough 100KM course change meant only 96 of us out of the 222 on the starters list completed the distance (that’s less than 45%) so to see those elite athletes come in in under 9 hours was amazing. Way to go Sage & Timmy! I can only wonder what Mick may have done if he hadn’t run 6 foot the weekend before. That must have hurt his performance. I was talking to Fats on Saturday and he was struggling to run at all, let alone 100k. Good question Charlie – He said he felt good and he may have edged Brendan but he would still have been close to an hour off the American’s I think – they just seemed to be so much more accomplished all round athletes based on the time I spent with them. Great write up. Thanks guys.